The tin snaps shut magnetically, and is quite pretty, if impractical. Blogging is slow these days, not because I’ve stopped writing or exploring, but because most things tend to languish in the Drafts folder. Plus the weak winter light doesn’t help with the photos. I’ll try to upload what I have in the coming days. Happy holidays to you all from an unseasonably warm Montreal! This was meant to be another installment in the “Joy of Inexpensive Pencils” series, but… is there such a thing as a “cheap” Caran d’Ache pencil? Perhaps they are more affordable in their native Switzerland, but we continue to pay a premium for them. 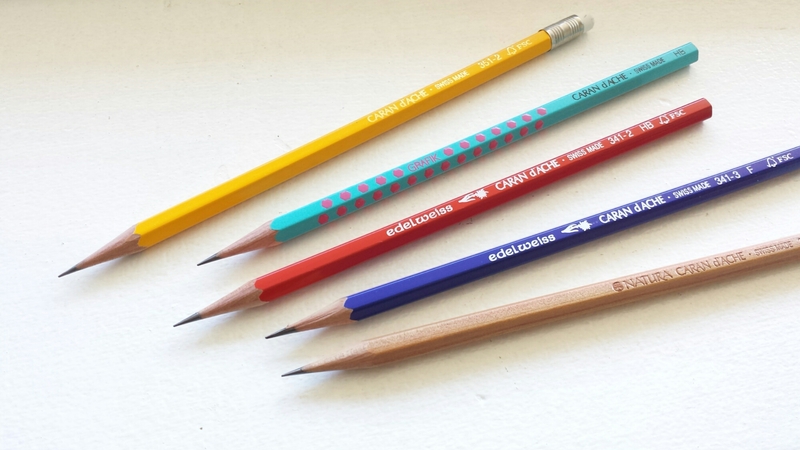 In any case, I find the current crop of lower-priced CdA writing pencils quite appealing. The 351-2 yellow eraser-topped pencil in particular was a pleasant surprise: it looks like a cheap school pencil but still has that unmistakable, almost glassy CdA “glide”. The cheerful lemon yellow paint and gold lettering compare favorably even to the Technograph 777. 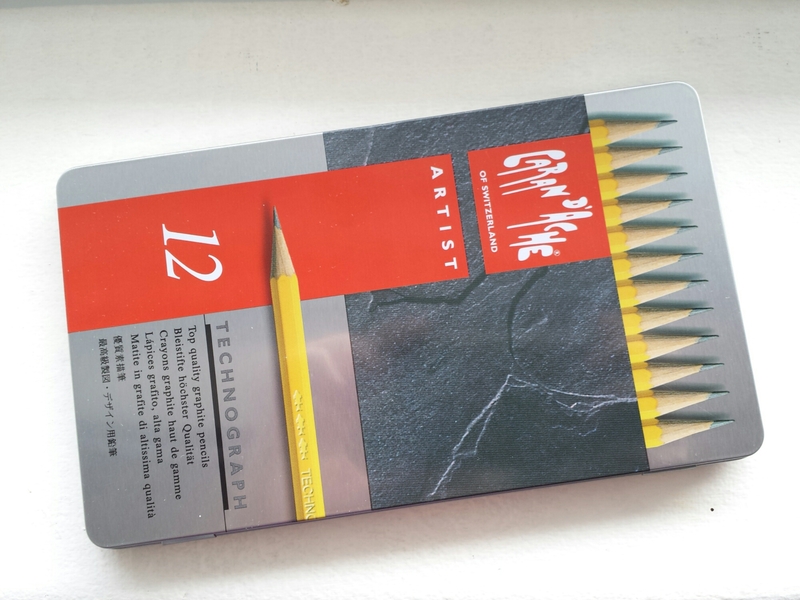 This yellow pencil costs slightly more than the other cheapies, at around 1 ~ 1.20 € each. 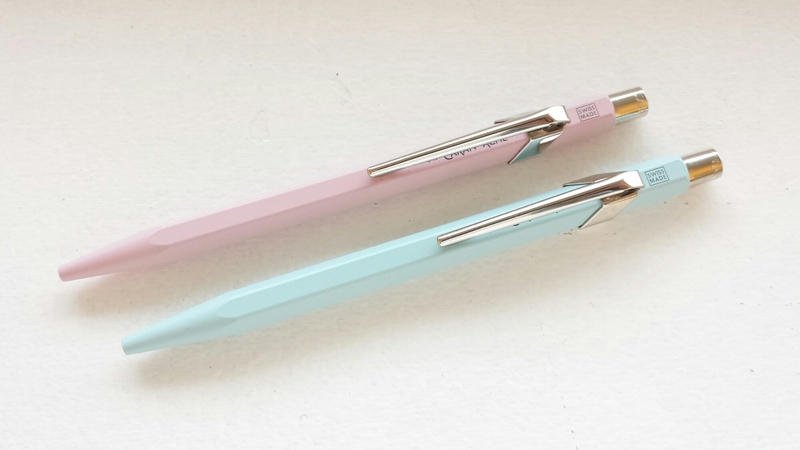 The Grafik and Natura pencils are next down the line; I would assume from the price that they share a common lead, but because the Natura is unpainted, it is infinitesimally slimmer, and that affects the writing experience somewhat (I felt that the Natura wrote lighter). The Edelweiss (0.60€) was a bit disappointing. Although it is better than most “school”-grade pencils, the HB felt a bit too dark and coarse for a Caran d’Ache. Still, the colors are great – the company produces an unbeatable red, and I personally have a soft spot for the vivid navy of the Edelweiss F.
Here is an older sibling of the current Technograph 777 Artist Tin Set. Judging by the the drip-paint CdA logo on the lid and the squarish print on the pencils, I am guessing it was produced between 1977 and 1998. (Here is a brief official account of the changes to the logo; and here is an article that discusses the typography of the newest one, that I got to know courtesy of La Plume.) 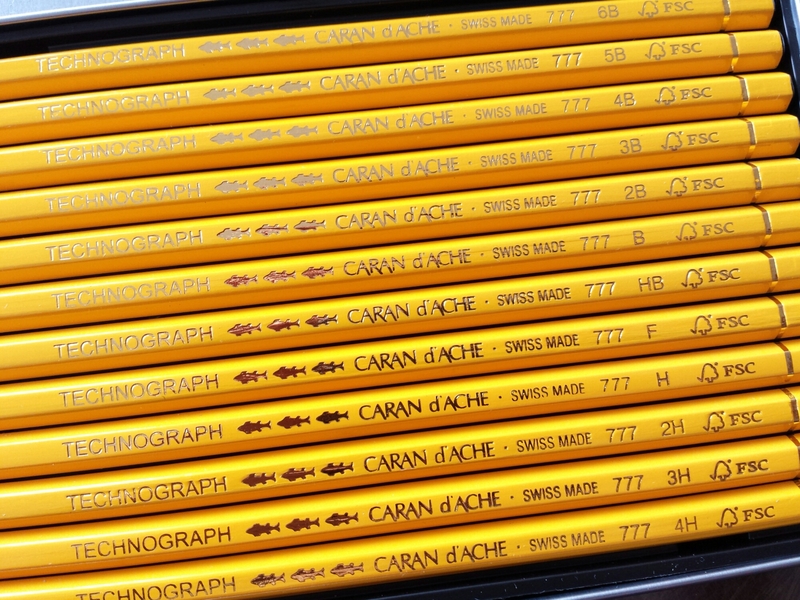 It’s interesting how Caran d’Ache completely reversed the order of the words later on, and Anglicized them too; I am personally very fond of the “+SUISSE+” mark on the older pencils. 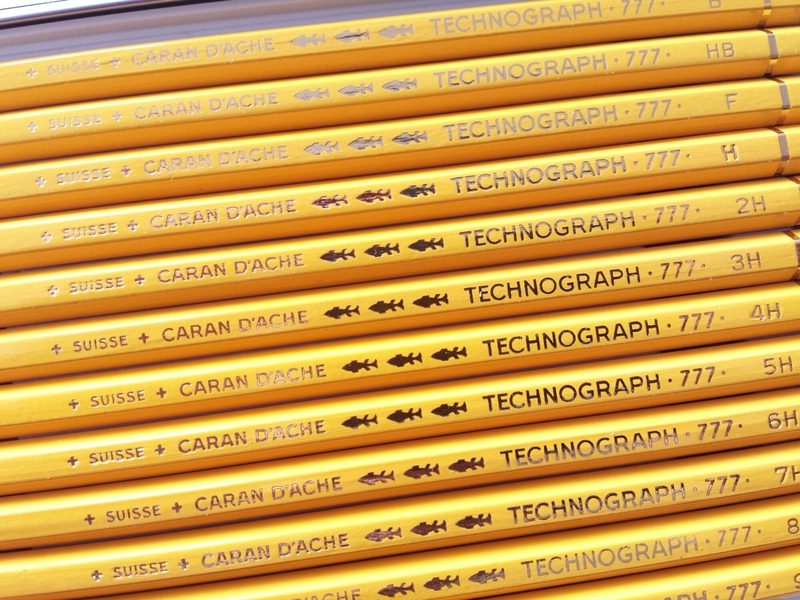 It seems that Caran d’Ache produced more grades of the Technograph in the past, from 9H to 6B, and so the tins came in two different versions too. The “Technical Drawing” set has grades from 9H to B; the “Artistic Drawing” set is from 4H to 6B. Only the latter survives. P.S. 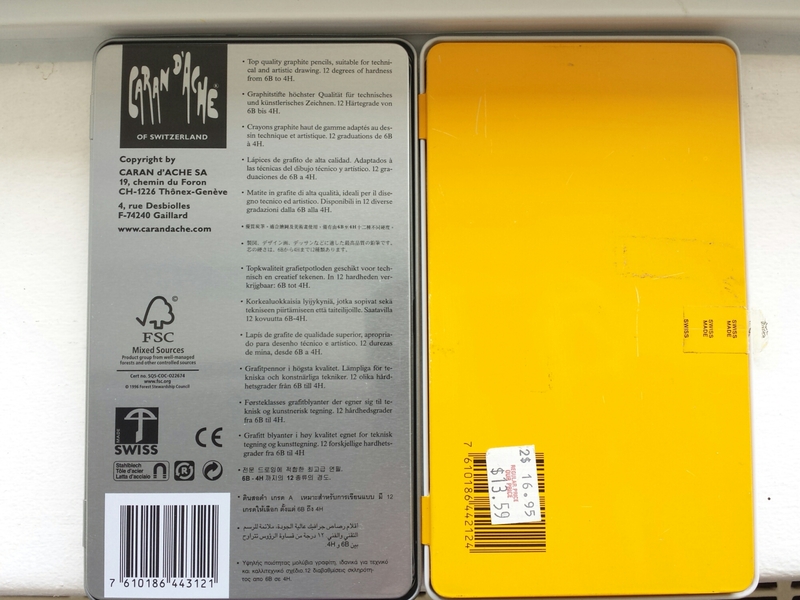 : A comparison of the back side of the vintage (yellow) and modern tins. 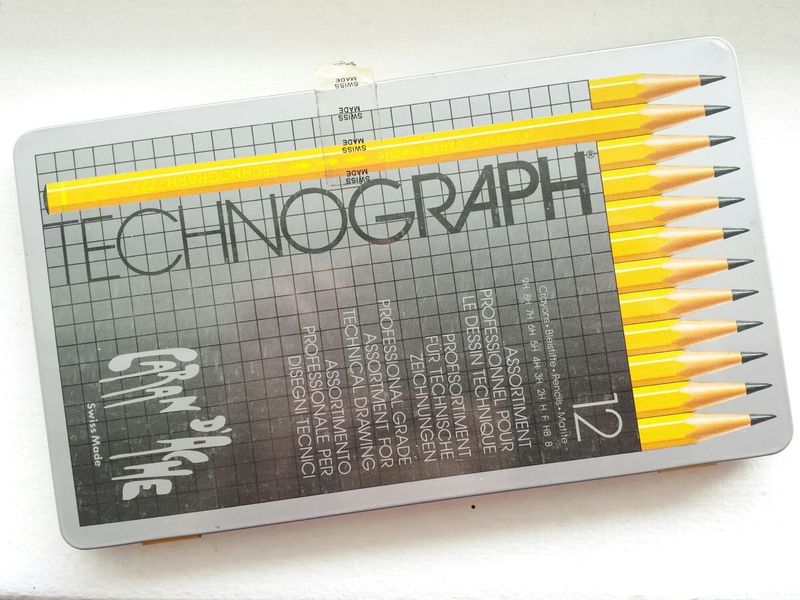 The Technograph 777 was my first proper yellow pencil. As La Plume points out, Caran d’Ache doesn’t seem to put a lot of effort into advertising its graphite pencils, except for the ultra-high-end Grafwood line; this is a pity since fans abound of the Technograph and even the school-grade Edelweiss. They are definitely hard to get. In Korea only one or two stationers stock them, but then only the Technograph and the Grafwood; here in this part of Canada you cannot get anything graphite from CdA at all. Price distortions make things worse: just as my Nikko G nib sells for $1 in its native Japan, $2 in the U.S. and $3 in Canada (because very often U.S. distributors supply the whole of North America), Korean retailers of CdA are said to get their stock from Japanese distributors, and all that border-crossing and double margins take their toll. In a world where “older” usually means “better”, I was a bit late bandwagoning on the CdA trend. 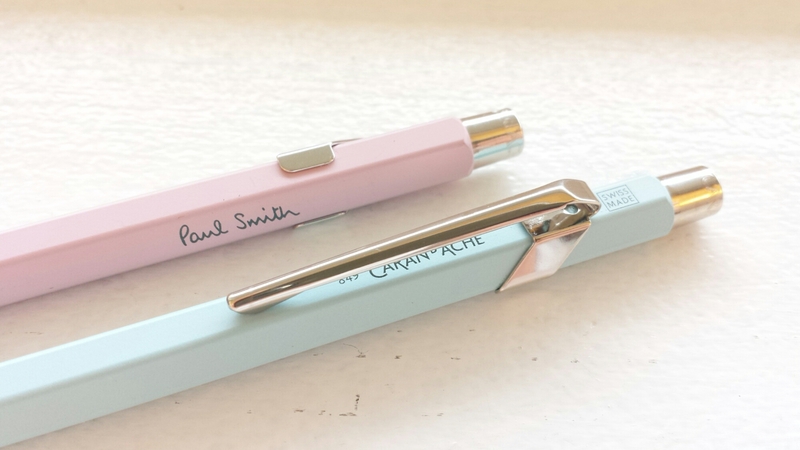 (In fact I was late for everything – the golden age of pencils and fountain pens seemed to be past.) Anyway, I soon found out that the Technographs I could get at that time were decidedly inferior to the ones produced before (as detailed here at Pencil Talk). 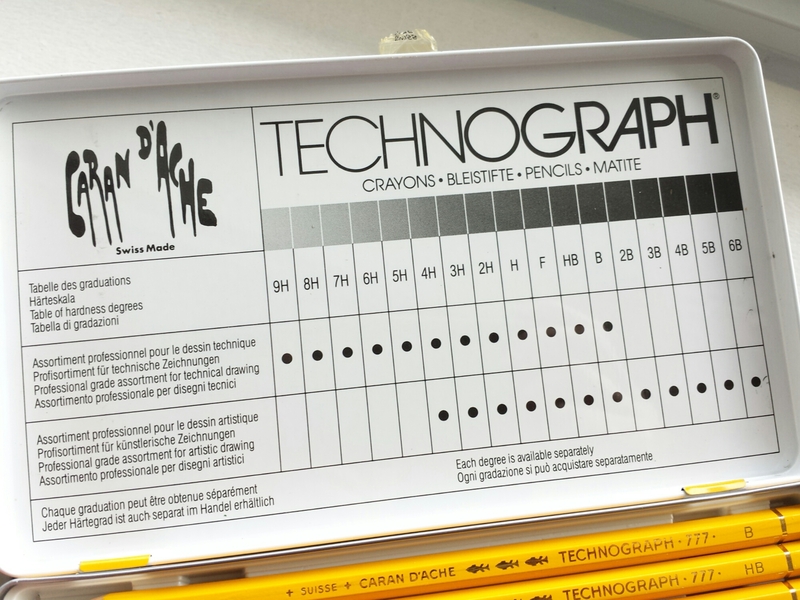 A Penhood friend gave me a proper pre-barcoded version as a sample; and then, when old stocks of the Technograph had all but disappeared, I found out that the 12-grade “Artist” set of Technograph 777s were produced in the same manner as the old Technographs and were still available. They were probably the last batch before production methods were changed or moved elsewhere or I don’t know what. 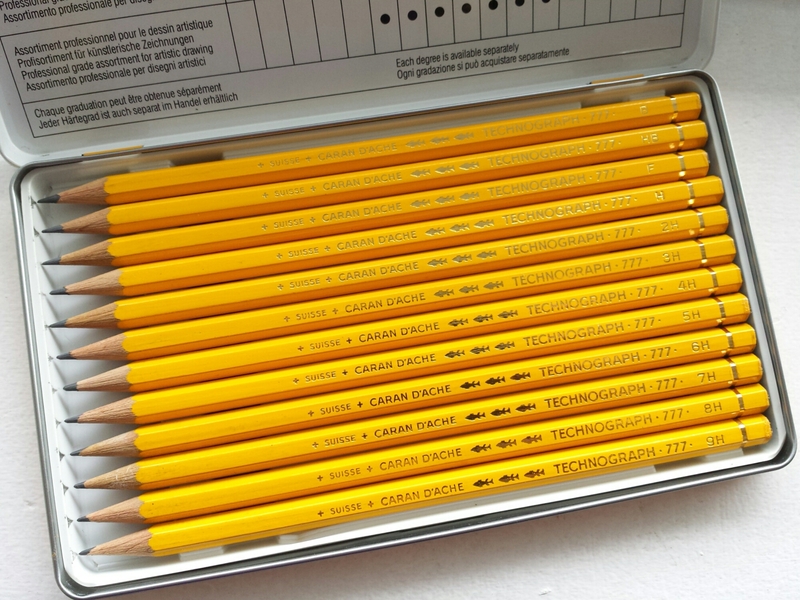 The pencils in the tin are an exquisite canary yellow; they are free from blemishes and have a thicker coat. The imprint however is the same as the modern Technograph, whereas the older, plastic-sleeve version lacks the FSC mark at the end. The finish on the modern Technograph is truly terrible. It chips easily (none of my other pencils chip like that), and there are cracks around the gold band, as is the area around the imprint. The color has more ochre in it too, and therefore darker. The surface smudges like crazy and wears off a lot faster than other pencils (people who sweat a lot complain). From top to bottom: Pre-barcoded, plastic-sleeve Technograph; Artist Tin Technograph; and the modern barcoded version. When discussing CdA pencils in general, the word that pops up time and again in Korean forums is “slippery”. The pencils share a very interesting characteristic, certainly embodied in the Technograph and passed down to the Swiss Wood no. 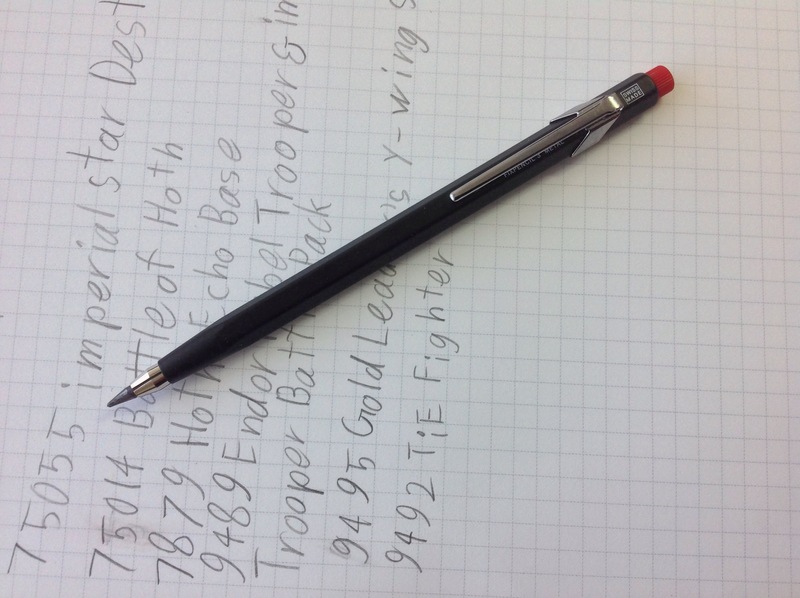 348: the lead seems very strong and highly compressed, and what you would simply call “smooth” in any other pencil is rendered here in a much more polished manner, like glass gliding across paper. You don’t feel any of the porousness that supports the “smooth” in American pencils. This, combined with minimal graphite transfer (tested with scientific precision here at Bleistift), makes for a very clean-writing pencil, similar in darkness to a Faber-Castell 9000. 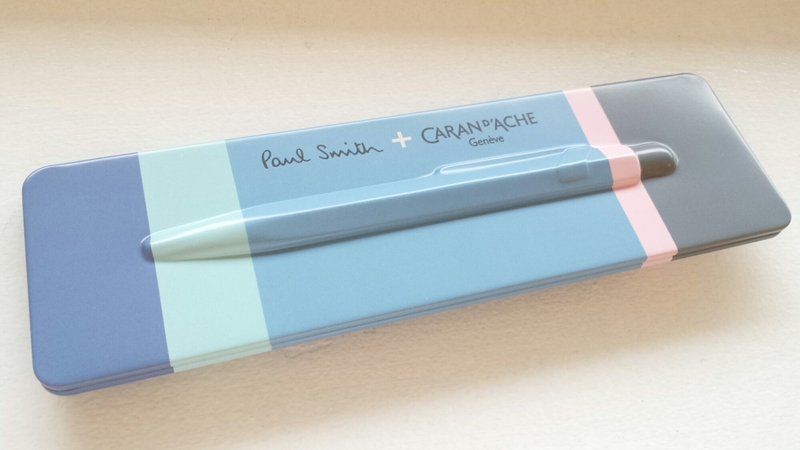 I can’t exactly say Caran d’Ache is my favorite brand, but I am attracted to many of their products. If I have a choice, for instance in colored pencil sets, I tend to opt for this over any other brand. 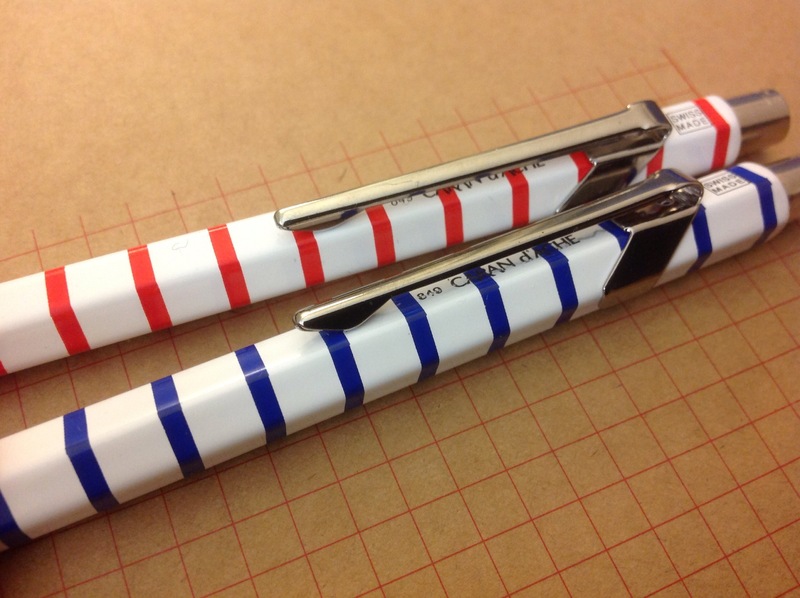 Part of the reason is that two of the people that got me interested in pencils were Caran d’Ache fans (one of whom I “follow”). If not for this connection, I doubt that I would have fallen for the Technograph 777 early on, for instance. The Fixpencil is a vanity object I’ve been coveting for a long time. I don’t as a rule use mechanical pencils, I have enough pencils and fountain pens to attend to and I only have one hand and only so much time to write with. But I never cease to be fascinated by holders that use thick lead, because I wasn’t aware that such a thing existed till I was in my 20’s – was it because I wasn’t an art or architecture student? Or was it simply because it wasn’t very popular at that time or wasn’t imported? Needless to say, I didn’t know dedicated lead sharpeners existed either, and I remember being vaguely frustrated with the blunt tip of my first 2.0mm holder. 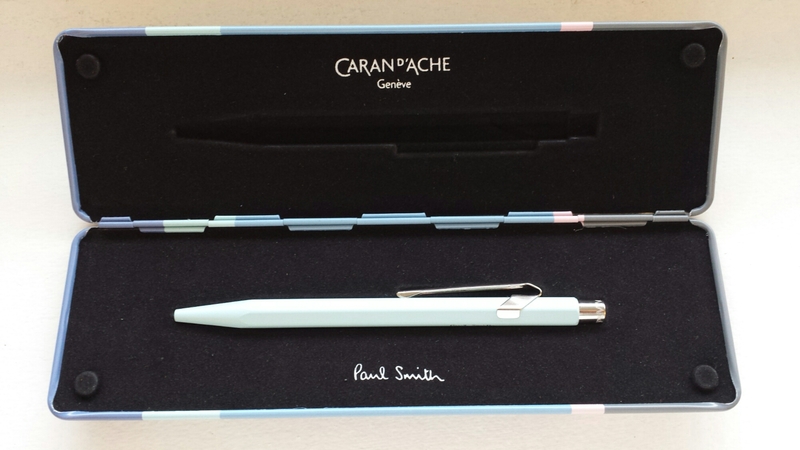 Caran d’Ache has lost its local distributor in Korea and so their products are hard to come by. Another thing is that CdA refills of any kind are pretty costly, so it takes some commitment to buy CdA products. So I was trying to forget this pencil, and then I watched the documentary Helvetica, and of course the designer Massimo Vignelli had to appear with that exact same Fixpencil in hand, complete with red cap! 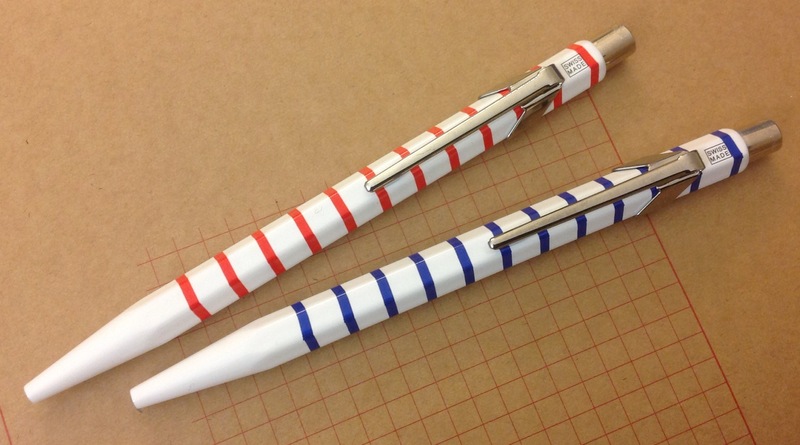 Everything in his office was color-coordinated to match the Fixpencil (or was it the other way around?). It was futile to resist. The lead comes in three degrees – HB, 3B and 6B. As with the Technograph, the lead is velvety smooth in the higher B-grades but without the sooty blackness one associates with such soft lead. 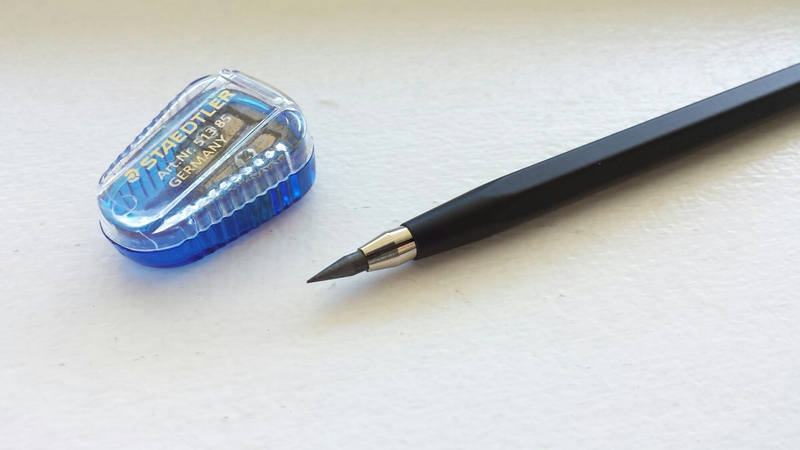 This particular Fixpencil uses 3.0mm lead, and I find it easy to sharpen it using a regular wedge sharpener – the lead is strong enough.